Look. At. That. 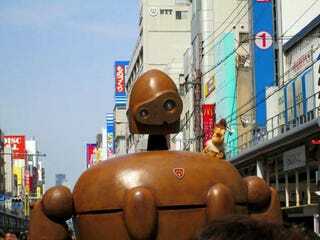 A Robot from Castle in the Sky walking around the streets of Osaka. With long arms and a thin neck, the robotic proportions don’t exactly lend themselves to cosplay. I’d imagine coming up with a wearable Robot outfit would be harder than, say, a Totoro costume. It’s certainly not a logical choice like Porco Rosso! Below, you can see photos of the impressive outfit via Gyavaso, including a 1/2 scale Flaptter from the film. Likewise, it’s well done. There are pics from other Twitter users, too. The cosplay and the Flaptter appeared at this year’s Amazing Japan Model Expo in Osaka.